Madhu Sarin is with the National Support Group for Joint Forest Management of the Society for Wasteland Development. She is based in Chandigarh, India. An analysis of joint forest management as a means of restoring degraded public forest lands and providing benefits to local people, with an emphasis on gender equity. The Joint Forest Management programme seeks to develop partnerships between local community institutions (as managers) and state forest departments (as owners) for sustainable management and joint benefit sharing of (usually degraded! public forest lands. Although it is too early to assess its significance conclusively' the Joint Forest Management programme is being viewed by some observers as a historic policy shift towards a democratic decentralization of forest management in India. It has to be viewed in the historical context of 14 decades of custodial forest management which progressively eroded forest dwellers' rights over their lands and forests. The resulting disempowerment and displacement of indigenous tribal and hill communities as well as the devaluation and disintegration of their community-based resource management traditions have been well documented (Guha, 1991; Gadgil and Guha, 1992; Kelkar and Nathan, 1991; Fernandes and Menon, 1987). The impoverishment and alienation of forest-dependent villagers resulted in widespread forest destruction and state forest departments being in perpetual conflict with forest communities. In fact, it was the acceptance of the states' inability to control access by impoverished and alienated forest dwellers to state-owned forests that culminated in the birth of Joint Forest Management. State forests account for 23 percent of India's land area and represent the country's largest land-based common property resource. Joint Forest Management has a particular significance for the majority of the country's 54 million tribal people and other disadvantaged forest communities, particularly women, as they continue to depend primarily on forests for their livelihood and subsistence needs. The official ground for Joint Forest Management was prepared by the new national forest policy of 1988. This reversed the states' earlier forest management priorities of meeting industrial and commercial requirements for forest produce and maximizing revenue towards an emphasis on environmental protection and conservation, "meeting the requirements of fuelwood, fodder, minor forest produce and small timber of the rural and tribal populations" and "creating a massive people's movement, with the involvement of women, for achieving these objectives" (Government of India, 1988). This was followed on 1 June 1990 by a circular (No. 6.21/89-FP) from the Ministry of Environment and Forests to the forest secretaries of all states and union territories providing guidelines for the "Involvement of Village Communities and Voluntary Agencies in the Regeneration of Degraded Forests". To date, 15 state governments have issued their own resolutions (government orders) specifying the basis of Joint Forest Management partnerships with local communities. These 15 states have 74.6 percent of the country's 75 million ha of public forest land and 91.4 percent of the country's tribal population. According to one estimate, by mid-1992 more than 1.5 million ha of forest land (about 2 percent of India's forest area) were already being protected (largely through the joint management programme) by more than 10 000 community institutions (both formal and informal) in ten states (Singh and Khare, 1993). Although precise information is scarce, there are several indicators of the positive impact that Joint Forest Management has had on forest conditions. In many states, forests under this form of management are regenerating with remarkable vigour and diversity. Local community institutions are protecting their forests far more effectively than the state forest departments could. West Bengal has the largest programme with over 2 300 registered forest protection committees (FPCs) protecting approximately 320 000 ha of public forest land. Remote sensing satellite data are beginning to show an improvement in both the quality and area under forests in southwestern Bengal, and the FPCs of this state have collectively received an international award for their contribution to forest regeneration. Elephants, which had disappeared from West Bengal's forests during the earlier part of this century, have started coming back. Studies in Gujarat, Haryana, Madhya Pradesh and West Bengal have also recorded improvements in the productivity and diversity of vegetation and increased returns of income to members of community institutions from non-timber forest products (NTFPs). Thus, the programme has undoubtedly made a good beginning in improving the condition of degraded forests and, to some extent, benefited those dependent on them for their livelihood and subsistence needs. However, for Joint Forest Management to attain long-term sustainability and become a viable long-term option, it is important not to lose sight of the complexity and diversity of local people's dependency on forests. The challenge is to move beyond community forest protection to develop options for the sustainable satisfaction of essential needs for forest products by local people. In its present form, barring micro level exceptions, the least discussed aspect of Joint Forest Management is the high opportunity costs of protection incurred by community members in general and their inequitable distribution between different subgroups and by gender, in particular. 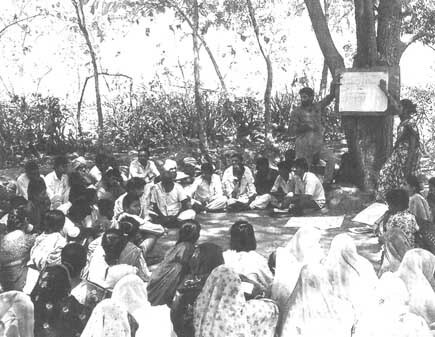 Before examining some of the issues mentioned above, it is useful to review the two most well-known pilot experiments of the early 1970s - in Arabari in West Bengal and Sukhomajri in Haryana-which provided the basis for subsequent official Joint Forest Management frameworks. The genesis of both lay in the realization by concerned officials that forests could not be "protected" from impoverished villagers; instead, viable livelihood alternatives needed to be devised to enable the villages to stop unsustainable forest exploitation and, instead, acquire a stake in forest protection. In the Arabari range of Midnapore district in West Bengal, the local villagers were motivated to form FPCs to protect public sal coppice forests in return for first preference in forestry department employment, free usufruct rights to most NTFPs and a 25 percent share in the net cash benefits from sales of short rotation sal poles when these were ready for harvesting. An initial success led to a gradual expansion of the effort to neighbouring areas and increasing support from West Bengal's forestry department. The concept of "social fencing", which evolved in Sukhomajri in Haryana, focused on enabling the villagers to reduce their dependence of unsustainable grazing practices in fragile, forested hills, hi This was facilitated by rainwater harvesting with an earthen dam built in the forests, whereby the cultivable land of small and marginal farmers was irrigated. A fourfold, almost immediate increase in agricultural production provided the villagers with an incentive to protect the darn catchment from grazing so as to prevent siltation of its storage capacity. Not all villagers could be expected to share the costs of protection equitably (by forsaking free grazing rights) without the assurance of equitable access to the benefits of protection (through increased agricultural production). Therefore, all households were allocated an equal share of water, irrespective of landownership or size of landholdings, in return for not grazing in the hills. Those without land or with very small holdings could use their share of water on land rented from larger landholders, thereby gaining access to a share of the increased agricultural production. · ensuring institutional sustainability by transferring resource management responsibilities to an autonomous community organization (Hill Resource Management Societies), founded on the principles of membership access to all households and an equitable sharing of the costs and benefits of protection among all members. The issue of sharing increased production from socially fenced forest areas with the villagers was raised at a subsequent date, and the benefit-sharing principle adopted was that the bulk of the increase in forest product output resulting from the villagers' protection should rightfully belong to the villagers. Thus, the greater the increase that the villagers help generate in forest production, the greater their share in the benefits. To date, about 40 autonomous Hill Resource Management Societies are protecting approximately 15000 ha of forest land under Joint Forest Management in the state. Unlike the long gestation of benefit sharing from poles or timber in West Bengal and other states, Hill Resource Management Societies become the forest department's effective partners in forest resource management almost immediately by obtaining priority access to annual fodder and Bharbur grass (Eulaliopsis binata) leases at concessional prices. Interestingly, Haryana's programme has remained small in scale, while West Bengal's effort has expanded dramatically. As such, it is the West Bengal Joint Forest Management framework that has served as a model for other states. One reason for the rapid expansion of West Bengal's programme has been the assured promise of a share of income from pole harvesting. This, in turn, has had two implicit consequences. The first has been a disregard for the immediate opportunity costs of starting protection. There is remarkably little information available regarding which groups or individuals have borne the largest share of these opportunity costs and with what consequences. The second has been the adoption of a traditional timber-centred forest management model even for Joint Forest Management while attention has been diverted from the need to develop need-based management alternatives. This has also implicitly increased the power of those members of the community able to forsake immediate consumption for longer-term benefits relative to those with immediate survival dependencies. As discussed in greater detail below, disturbing evidence is beginning to emerge about the gender-based differences of such consequences, with women incurring the highest opportunity costs of protection and having no clear entitlements even to the longer-term benefits. Expansion of the pilot experiments into state programmes necessitated official resolutions stating the terms and conditions for this form of management. Both the content and process by which these resolutions have been framed reflect the inevitably unequal relationship between powerful state bureaucracies and a large number of small, diverse and scattered community institutions. In essence, the state Joint Forest Management resolutions assure participating villagers free access to most NTFPs and a 25 to 50 percent share of poles and timber at final harvesting. In return, the villagers are expected to protect the forests after forming an organization conforming to the membership and structure specified by the forest department. The forest departments reserve the right to cancel the Joint Forest Management agreement unilaterally (and, in most cases, even to dissolve the community institution itself). In such a situation, the community has no right to any compensation for its investments of labour, time or capital. If the forest department fails to honour its commitments, the villagers have no reciprocal rights for penal action (except in Haryana where they can at least demand compensation). Based on shortcomings evident during implementation, some state Joint Forest Management resolutions, including those of West Bengal and Orissa, have been amended or totally revised. For example, the Government of West Bengal recently constituted an expert committee to review benefit sharing and related provisions in its resolution to ensure sustainability of the state's large Joint Forest Management programme. Parallel to, and often preceding, forest department initiatives, forest-dependent villagers in many states have initiated forest protection on their own. Thousands of such self-initiated forest protection groups are regenerating an estimated 400 000 ha of forests in the eastern states of Orissa and Bihar and, on a smaller scale, in Gujarat, Rajasthan, Karnataka, Madhya Pradesh and Andhra Pradesh. These very diverse groups are primarily confined to areas where people continue to have a strong economic dependence on forests and where a tradition of community resource management survives. Their internal stability is often dependent on an equitable sharing of costs and benefits among all members (almost exclusively men) and open, accountable decision-making. The inability to maintain a dynamic balance between internal and external pressures can result in the sudden collapse of these groups and the "mass looting" of their protected forests. As the state-sponsored Joint Forest Management expands, it is inevitably beginning to run into these self-initiated groups which confront the forest departments with a new situation. These village groups have their own experiences of creating consensus in favour of forest protection, based on their members' forest management priorities and the problems they face in sustaining their efforts, and they are pointedly questioning the assumptions on which the Joint Forest Management resolutions are based and specifying their own terms and conditions for participating in the programme. These conditions are centred around maintaining their autonomy; being provided the authority needed for forest protection and need-based extraction; and having the right to choose their own leadership and determine their own forest management priorities. They also desire mutual rather than one-sided accountability and acknowledgement of the high opportunity costs that the group members face for forest regeneration in the benefit-sharing provisions. Many of these groups strongly oppose any final felling of mature timber by the forestry departments, in part because of the fear of losing their painfully regenerated forests once again. The challenge this is posing for the forest departments is that of showing responsiveness by accepting a facilitative rather than a directive role. This implies adapting the official Joint Forest Management frameworks to enable the forest departments to participate in the villagers' initiatives rather than vice versa. Only such a mutually acceptable meeting ground, which builds on the strengths of both parties rather than their weaknesses, can lay the foundations for joint management partnerships capable of regenerating India's forests equitably and sustainably. There are several equity-related issues that need urgent attention if the long-term sustainability of Joint Forest Management is to be increased. These include: making the relationship between community institutions and the forest departments more equitable in terms of sharing the costs, benefits, authority and rights related to forest management; and inter- and intravillage equity issues which, if left unaddressed, could generate conflicts threatening the programme's survival. Forest regenerating as a result of social fencing in Haryana once in a while, firewood is needed daily with unbroken regularity. With almost exclusive male decision-making, in both the community institutions participating in Joint Forest Management and the autonomous groups, women's responsibility for meeting household cooking fuel needs has been almost totally overlooked by both. Recent field studies in West Bengal, Bihar and Gujarat (Sarin, 1994; Sarin and SARTHI, 1994) have revealed a disturbing pattern of dramatic increases in women's labour and time required for cooking fuel collection, combined with their switching to inferior, often ecologically undesirable fuels after the initiation of forest protection by the community institutions. Where women are forced to go to distant, as yet unprotected forests for collecting firewood, there is an invisible transfer of unsustainable pressure to more distant areas in order to permit regeneration of those that are nearer. With little short- or long-term planning of alternatives for household cooking fuel needs owing to the focus on timber in both Joint Forest Management and community forestry protection, the policing role of the forest departments has essentially been shifted to the men in the community, thus further undermining women's rights because of the social unacceptability of challenging male authority within the home. The gender-differentiated impact is not restricted to firewood. Forest regeneration is commonly assumed to benefit men and women equally. However, preliminary field investigations suggest that forest protection for timber may be at the cost of a reduced availability of some of the more important NTFPs for women and other disadvantaged groups. In two villages in West Bengal where such impacts were investigated recently, it was found, first, that most of the NTFPs were almost exclusively collected by women and, second, that the yields of important products had declined following protection. For example, the sale of sal leaf plates is a common source of income (albeit at a rather low return for the labour invested) primarily for poor women in many areas of West Bengal, Orissa and Bihar. The increasing height of protected sal trees results in a reduced availability of sal leaves as a result of the usable new leaves growing beyond easy reach. Similarly, tendu leaf, another important source of seasonal cash income, primarily for women, tends to decline in a regenerating forest, as the tendu bushes are shaded out by the growing trees unless specifically managed to prevent this. Tendu bushes also need annual pruning for good leaf growth. No state Joint Forest Management resolution has yet empowered the partner community institution to undertake such pruning. Each management decision implies different costs and benefits, and the impact is likely to differ by gender. Undoubtedly, both women and men will have to incur some opportunity costs to rehabilitate their forests. Unfortunately, at present, whether it is autonomous forest protection or formal Joint Forest Management, women are seldom consulted or informed about alternative management options, despite their incurring disproportionate opportunity costs. They are simply being assigned the role of passive implementers of forest department or male decisions and educated, "motivated" or "pressured" into conforming for the "family good". The most common additional role assigned to them, whether in Bihar, Orissa or West Bengal, is that of turning women from outside the community away from the protected forests. In this respect, community forest protection, as currently practiced, seems to be turning women against women without providing a satisfactory solution to the problems of either group. Women are also likely to be unfairly treated when it comes to sharing benefits derived from final harvests of timber from the forests regenerated under Joint Forest Management. The state statutes provide for two types of arrangement for benefit sharing from the final harvest. Either the entire cash income or a share of the produce will go to the community institution common fund, or all or a part of it will be distributed among individual members. Thus, benefiting is directly tied to membership in the community institution, yet women's rights and entitlements have been almost totally overlooked by most of the state Joint Forest Management statutes. In nine of the 15 states involved in the programme, there is no clear provision for women's membership in the community institution. Most statutes foresee one "representative" per household or are vague on the matter. The result is that women effectively get excluded from community institution membership and are therefore also likely to be excluded from the benefits. So far, benefit sharing in the final harvest has taken place in only two cases- in Arabari in West Bengal and Soliya village in Gujarat. In Arabari, most of the shares went to men (since then, the Joint Forest Management statute has been amended to make wives joint members with their husbands). In Soliya, the community institution had a primarily male membership while women, by and large, remained out of the picture. Beginning in 1995, several hundred FPCs in West Bengal will become eligible for benefit sharing. In that context, the question of who - husband or wife, or husband and wife jointly - should get the share was posed to the members of three FPCs in the south Bankura Division in January, 1994. Both women and men were present at these meetings. In all three villages, all the women felt that the shares should be divided equally and given separately to husband and wife. The concepts of "joint accounts" or of the husband being al located more as the "head of the household" were rejected. The women, responsible for the majority of household sustenance, wanted control over an equal share of the income, particularly given that they had incurred of the opportunity costs of forest protection. There is a clear need to structure gender equity into Joint Forest Management and to ensure that women do not get left out of the programme by default. Joint Forest Management represents a progressive shift towards state recognition of the interdependence between the wellbeing of forests and the well-being of the women and men dependent on them for subsistence and livelihood needs. Although it does not transfer the ownership or title of the land to the local community, the administrative legitimacy that state Joint Forest Management resolutions lend to benefit-sharing arrangements with community institutions has motivated several hundred thousand villagers to initiate or participate in forestry regeneration through community controlled protection. Caution is warranted, however, in using the improving condition of forests as the prime indicator of the "success" of Joins Forest Management. Most "communities" encompass internal hierarchies differentiated by caste, class, tribe and gender; the nature and extent of the dependence of each subgroup on forests varies within and between communities. As currently practiced, by and large Joint Forest Management is overlooking such variations. Because of its primary focus on forest protection for timber production rather than need-based forest management, the programme is empowering those with the least forest dependence to compel the more dependent community members to forsake immediate extraction without providing them any alternatives. Such inequity of impact is most differentiated by gender to the near total exclusion of women (who constitute the majority of forest users) from programme-related decisions. The resulting increases in inequity within and between communities as well as by gender are also a potential threat to the long-term sustainability of Joint Forest Management. For Joint Forest Management to represent "participatory" forest management, its emphasis on regenerating timber through community protection needs to be shifted to developing sustainable alternatives for meeting the diverse forest produce needs of the most dependent members of community institutions. This requires introducing participatory disaggregation of forest dependence by caste, class, tribe and gender at the community level, and evolving mechanisms for meeting the immediate essential needs of the most dependent members through appropriate forest management interventions prior to the commencement of joint management. The marginalization of women in Joint Forest Management needs to be rectified by structuring their integration in community institutions as independent primary and management committee members and clearly specifying their entitlements to benefits in the state Joint Forest Management resolutions. Fernandes, W. & Menon, G. 1987. Tribal women and forest economy, deforestation, exploitation and status change. New Delhi, Indian Social Institute. Gadgil, M. & Guha, R. 1992. This fissured land, an ecological history of India. New Delhi, Oxford University Press. Gouvernement indien. Nacional Forest Policy Resolution. New Delhi. Guha, R.1991. The unquiet woods: ecological change and peasant resistance in the Himalaya. New Delhi, Oxford University Press. Kelkar, G. & Nathan, D. 1991. Gender and tribe: women, land and forests in Jharkhand. New Delhi, Kali for Women. Sarin, M.1993. From conflict to collaboration: local institutions in Joint Forest Management. JFM Working Paper No. 14. New Delhi, SPWD/Ford Foundation. Sarin, M. 1994. Regenerating India's forests: reconciling gender equity with Joint Forest Management. Paper presented at the International Workshop on India's Forest Management and Ecological Revival, New Delhi, 10-12 February. Sarin, M & SARTHI. 1994. 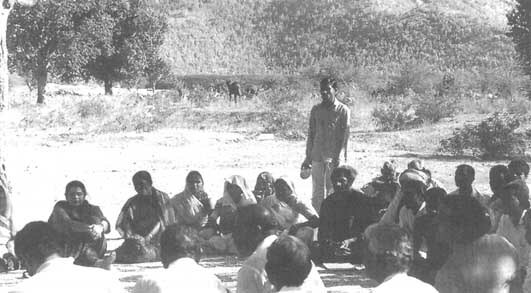 The view from the ground: community perspectives on Joint Forest Management in Gujarat, India. Paper presented at the IIED Symposium in Local Hands, Community-Based Sustainable Development, held at the University of Sussex, UK, 4-8 July. Singh, B. & Khare, A. 1993. People's participation in forest management. Wasteland News, 8(4). SPWD. 1993. Joint Forest Management update. New Delhi.